Stockport PCT experienced a rise in GP Referral to Secondary Care from April 2008 which coincided with the introduced of Free Choice in the Choose and Book system. Previously, if a G.P. made a referral to Trauma and Orthopaedics, General Surgery, Dermatology, Urology or Gynecology the Choose & Book system would direct the referral to the local Tier 2 service. In April 2008,’Free choice’ was introduced, which removed this facility and referrals to Tier 2 services fell. In the first 6 months of 2008/2009 Tier 2 accounted for just 23% of total referrals, compared with 33% for the same period the previous year. The PCT wanted to understand the effect of a change in demand on waiting times. The initial analysis centered on the Orthopaedic Assessment Service (OAS). Using Scenario Generator, the PCT modelled the contracted flow of activity to determine if it was feasible for all patients to be seen within a 4 weeks period. The results showed that, at the contracted levels of demand and capacity, 97% of patients could be seen within 28 days and 100% of patients could be seen within 37 days. 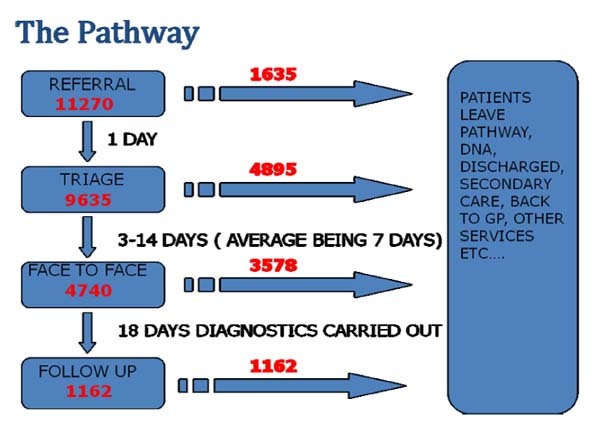 Simulation and modelling provided the PCT with a means of understanding the flow of patients from referral through to discharge, and the expected time taken during the process. From this position they expect to go on to examine the impact on waiting times if there is further demand on services, if the service is redesigned, or if there are changes to the capacity available in the system. A similar system can also be used to examine other pathways.